I love the colors and textures of compost and I have been trying to photograph my compost - both in the big bin in the yard and in the small container I keep in my kitchen. I find this photo to be one of my favorite garbage photos so far. I like the formality that my grandmother Celia's cloth napkin gives the whole thing. And by the way - I didn't change anything except lifting it out of the compost container and laying it on the napkin. How many ingrediants can you recognize? Have you read the Native American novelist Gerald Vizenor? He has a great character who preaches about Refuse Meditation... 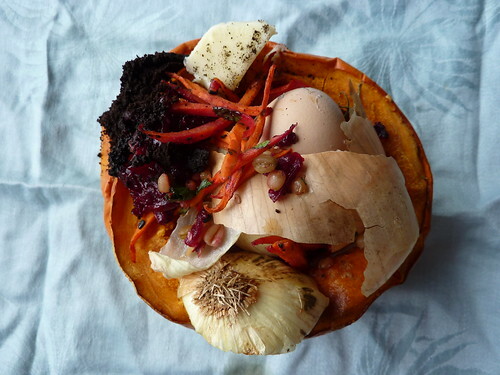 I think compost is pretty too.